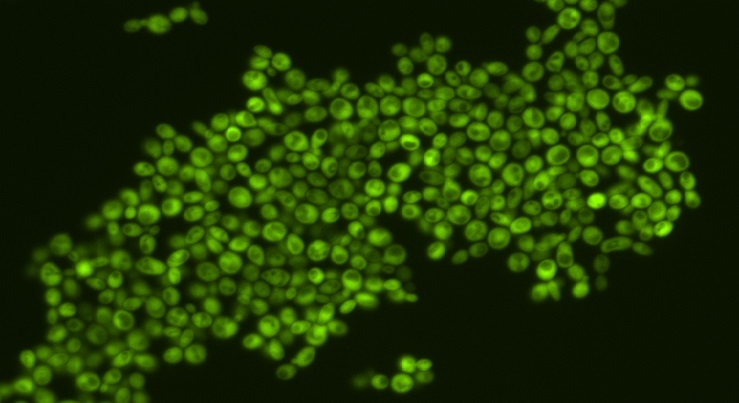 We investigate how genes and biochemical process control living cells. We examine the ways in which the “wiring” of gene regulatory networks defines which genes are expressed and when, and how cellular individuality contributes to uncertainty in drug responses and drug resistance. Our research distinguishes itself through the use of sophisticated mathematical models and computer simulations to explain complex phenomena and guide the construction of synthetic DNA to mimic or control natural gene networks. Trainees in our lab include graduate students from the Faculties of Medicine and Science (Physics), and undergraduate students participating with the uOttawa team in the international genetically engineered machine (iGEM) competition. The Kaern lab accepts students from graduate programs in Physics and Cellular and Molecular Medicine. Variability in gene expression within a population of genetically identical yeast cells. Our lab investigates the function and dynamics of gene regulatory networks using a “systems science” approach that combines advanced genetic engineering, single-cell and time-lapse measurements, and computational modelling and simulation. We apply this combination of synthetic, quantitative and systems approaches in research projects focusing on mechanisms of non-genetic drug resistance, variability in cellular drug responses, the mapping of genetic networks and signalling pathways, and the properties and dynamics of transcriptional regulatory network motifs. We are also engaged in research collaborations, including network inference, the modelling of cancer-killing viruses and the modelling of adult hippocampal neurogenesis. The development of drug resistance is a major health challenge. We have been able to demonstrate theoretically that drug resistance may arise from the way that all living cells decode genetic information. We are currently seeking to demonstrate this phenomenon in the lab. This work has revealed a more complex picture in which the networks that control the expression of drug resistance genes play a central role by enabling bet-hedging and long-term non-genetic inheritance. Patients with the same illness often respond very differently to the same treatment. This extends even to genetically identical cells treated with DNA damaging agents and cancer drugs. We have yet to pinpoint why this variability in drug responses arises, but suspect it comes from how cells integrate information from multiple pathways conveying information about DNA damage, cell cycle progression and cellular stress. Most cells respond to stimulation and stress by altering the genes they express. To understand how this works requires understanding how different biomolecules and genes interact with one another. To facilitate the mapping of these networks and pathways, we have developed and tested experimental and computational methods that examine thousands of simultaneous interactions. To understand the often very complicated systems that control gene expression, we investigate the network motifs that represent the fundamental building blocks of larger networks. This line of research has already revealed new fundamental insights into cellular signalling processing and enables large-scale genetic network engineering and improves the mathematical models needed to study larger, more complex networks. Trainees joining the Kaern lab, including undergraduate students participating in the uOttawa iGEM program, have the opportunity to gain valuable expertise in molecular biology methods, advanced genetic engineering, microscopy, flow cytometry, mathematical modelling and data analysis.